After a year of testing, Costco is rolling out a full-service mortgage lending program on its website. NEW YORK (CNNMoney) -- Not only can Costco shoppers find bulk-packs of chicken wings, 24-rolls of toilet paper and large-screen TVs at a discount, they can now land themselves a mortgage. After a year of testing, Costco (COST, Fortune 500) is rolling out a full-service mortgage lending program on its website in partnership with First Choice Bank, a New Jersey-based community bank, and 10 other lenders. 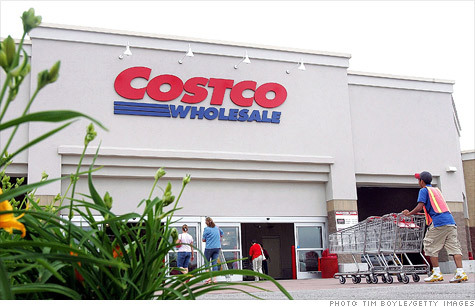 Costco's partners have issued more than 10,000 mortgages to members under the program. But Lauren Kutschka, Costco's manager of financial services, expects that number to swell as the warehouse retailer markets the service more aggressively to millions of members in its stores and in its weekly publication Connection. "I went in to buy some bottled water, big bags of chips, cereal and some Nutri-Grain bars that I eat on my route," said Ray Sheets, a FedEx (FDX, Fortune 500) courier from Canton, Ga. "I saw a home loan brochure on my way out and picked it up." Sheets went onto Costco's site, put in his information and quickly accessed offers from four lenders. The rates, closing costs and terms were listed up front. And the closing costs -- of about $2,500 -- were about a third of what he would have had to pay through other lenders, he said. Within a few weeks, Sheets refinanced his $170,000, 15-year fixed mortgage carrying a 4.25% rate into a 30-year loan with a rate of 4%. The move lowered his monthly payment by nearly $500 to $811 a month. Mortgages are just one of several financial products available to Costco's members. The warehouse club also offers health and auto insurance, as well as stock brokerage services, said Kutschka. Up next: Auto loans and student loans. "We've always known that our members wanted more financial services," she said. "Right now, we offer recreational vehicle and boat loans and we're going to add auto loans to that. We're also looking to offer student loans." Costco had started offering mortgages a couple of years ago but the service provider it was using didn't share enough details about how it was dealing with Costco's members, said Kutschka. So Costco started over from scratch, partnering with First Choice Bank to build a new mortgage lending portal. Much like LendingTree, the site gathers quotes from various lenders. However, there is one key difference. Under the Costco program, the borrower's identity is revealed only after they officially select the lender, said John Alexander, business development director at First Choice. With many other lead-generation sites, the consumer fills out an application and any lender can make an offer and begin sending marketing communications to the applicant without restrictions. Costco members will still need to do their homework and compare offers, though, said Keith Gumbinger of mortgage information company HSH.com. Even after a year of testing, Costco's service is still new. First Choice said it will police the other lenders to ensure they comply with Costco's policies, which include giving accurate rates and terms and following up quickly on questions and requests. The technology enables Costco to monitor individual applications and make sure they are handled properly and expeditiously. Costco takes no profit on the lending itself, but it does get paid to market the service. In Sheets' case, his lender, Bank of the Internet, sent a representative -- an attorney -- to his home to close on the loan, he said. She answered all his questions and explained all of the legal terms in the contract. Gumbinger said the service may prove better for people like Sheets, who are refinancing than those who are purchasing homes. "The mortgage origination process is still a hands-on, face-to-face process," he said. "It involves a comfort level and you don't get that with an online service." That may be true in the initial stages of the borrowing process, but once a Costco borrower has chosen a lender the level of service steps up, as Ray Sheets's lender did for him. Given the size of Costco's footprint and its ability to squeeze great deals out of vendors, Costco members should at least "include the site in their search plan," said Gumbinger.